Within the theme of inquiring into quotations people famously never said - is this intrigue of how we change thought, sometimes unconsciously, and almost innocently. In our mindfulness of mind our disrespects are done with great respect. The name I have for this is 'Consciousness Co-Opting', where we lay claim to another's reputation to support our own in the bright shadow of positive projection. It is a form of false flattery, similar to forms of 'cultural appropriation', where we borrow another's culture, inappropriately appropriating it, to make our own point. "This first, be the change you wish to see in the world." "We need to be the change we wish to see in the world." "Be the change you wish to see." The quote (seemingly) cannot be attributed to the written works of the 'Mahatma', Mohandas Karamchand Gandhi (1869-1948). It can, though, be attributed to the recollections of his fifth grandson, Arun Gandhi (1934 -) with the modification of Arun's own call to be the 'agent of change' you wish to see. “If we could change ourselves, the tendencies in the world would also change. Yet, I am not sure that this is as close to the sentiment at its source that we can get. In wishing perhaps for others to embody the respect and care for checking another's words I would wish for all thinkers (and myself), I took the few moments to look further. To trace a mis-quote, it is often good to begin with an authoritative source. 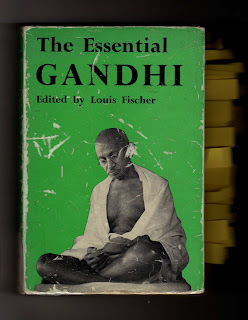 In Dunphy, Griffiths, Benn's (2003) excellent resource 'Organisational Change for Corporate Sustainability' there is a reference for the Gandhi quote: "I must first be the change I want to bring about in my world." (p. 269) taken from D. Chatterjee, 'Living Consciously (p. 45)'. In Debashis Chatterjee's (1998) Leading Consciously: A pilgrimage towards self-mastery, a wonderful homage to the Mahatma as leader, there is in fact that quote on page 45 (unattributed). On page 146, though, the trail does get exciting as the quote is restated, this time with a reference to 'Fischer (1962)' - with no page source. In looking, page by page, line by line I had the pleasure to be re-acquainted, not only with the words and biographical path of great struggle, but with the philosophy of Swaraj (self-rule) itself. The famous mis-quote is (not unsurprisingly) not to be found. We seek to 'be the change' ... and forgot to think first, for whom it is - that 'we are'.